Removes tough soap scum and hard water stains. Nonabrasive. No rinsing or scrubbing. EPA Registered. Hospital-grade disinfectant. Cleans porcelain, ceramic tile, concrete, masonry and iron. Removes lime, rust, stains and paint. 100% natural, won’t harm surfaces. Individually wrapped 6 x 3/4 x 1-1/4 sticks. Quickly cuts through soap scum, hard water stains and film with the foaming action of Oxy. 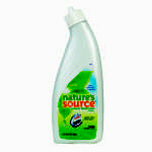 Non-abrasive formula cleans, shines and deodorizes without scratching. Lemon scent.